Having clear swimming pool safety policies is a great way to keep you and yours safe during those warm summer months and posting those policies helps ensure safety. Moreover, incorporating some of these practices will help you to feel secure in knowing that you are doing everything you can to provide a safe and fun swim environment for you, your family, and friends. Below are two sample policies. Both may be downloaded and altered as needed for your pool. The owner/operator safety policy should be made clearly available to all pool employees and managers if you have a public pool, and the swimmers' safety policy should be made clearly visible to anyone who enters your pool, regardless of whether your pool is public or private. 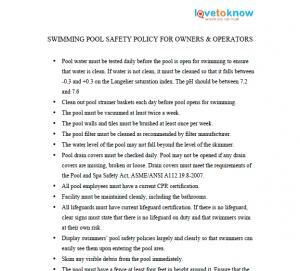 Read the policy carefully and delete any sections that do not apply to your pool, or that you do not want to use. Add sections that contain rules you want included but aren't addressed in this sample. 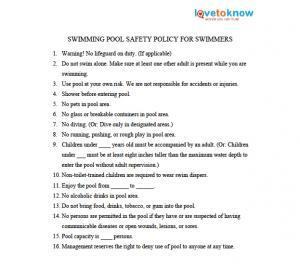 You may need to fill in some information in the policies, such as the pool hours, pool capacity, whether there is a lifeguard on duty, and if so, which hours he or she is on duty. If you need help downloading or opening the sample, take a look at these tips. Additionally, it is best to have a lawyer review your pool safety policies before putting them into use, particularly if your pool is open to people outside of your immediate family. Posting policies will help keep your pool safe, but for even more security, take the following precautions. While it makes good sense to have a fence around your pool, few people actually have one. Not having a fence makes it much easier for unsupervised children to get curious about the swimming pool, something you don't want if you're not around to supervise. Install a safety fence that is at least five feet high. A wooden privacy fence it a better option than chain link because it blocks sight of the pool and there are no footholds for curious children to climb. The vertical slats of the fence should be no greater than three and a half inches apart. Consider installing a self-closing and self-latching gate that is no less than 54 inches from the ground up. These kinds of gates can easily prevent an exploring toddler from reaching up and trying to undo the latch. Another tool in your safety belt armor is a door alarm. Installing a childproof safety alarm can go a long way to providing additional security. This way, even if a child manages to unlock a safety fence, you'll be sure to know about it. Many of these childproof safety alarms can be battery or electrically powered, and some come with a convenient keypad switch. Keep in mind that this keypad switch should be placed high on all doors leading from the house to the pool to make it easy for adults to disable the alarm, while discouraging youngsters from playing with it. Chemicals like chlorine are designed to keep your pool free of algae and bacteria. Some of these same chemicals, however, can be a hazard to your health. Lock up any chemicals. A great way to keep everyone safe is to store all cleaning chemicals in a fixed location. Keep in mind that higher concentrations of chlorine gas can be produced when the chemicals in chlorine are mixed with water. Keep chlorine in an airtight container and under wraps. Make it a child-free zone. Keep children far away from the swim area once you begin adding these cleaning chemicals to your pool. Place a sturdy cover over your pool during the off-season. 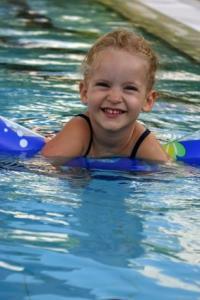 Research shows that young toddlers can drown in those small amounts of water that collect on soft pool covers. If you must use a soft cover, add polystyrene flotation devices to the water before putting on the cover. This will leave less area for water to collect. One of the very best ways to prevent an accident or injury around a swimming pool is to teach your family some smart safety tips. Always supervise children. This cannot be overstated. Never, under any circumstances, should you leave an infant, toddler, or preschooler alone while near, or in, the pool. Keep your pool well-lit, especially at night. Not only can this be a great deterrent against would-be robbers, but it also allows you to quickly and easily see the goings-on in and around the pool area. Close and latch the gate. If you do install a fence or a gate, remember to close that gate. It doesn't make much sense to go through the expense of installing a gate and then leaving it wide open. Proper attention to safety is an important part of pool ownership. Vigilance to safety policies, as well as providing posted safety rules for swimmers and pool personnel, can help protect you, your family, your property, and anyone else who may use your pool.